A handheld computer is a small, portable device with screen and keyboard, and usually capable of reading barcodes or RFID tags. It will usually operate independently, in batch mode, or connected to a central database by a radio frequency link. It is characterised by small size, for mobility, and rugged construction. The first hand held computers operated in batch mode. They had on board memory, and all information collected with the handheld computer was saved for subsequent transfer to the main database. This transfer was usually achieved by connecting the unit with a cable or by putting it in a docking station. The docking station enables communication, and also charges the batteries in the unit. 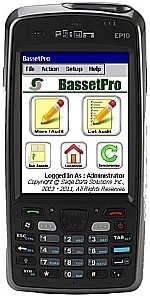 Information from the central database can be loaded to the handheld unit, enabling the user to reference that information as the unit is used. Modern units can store information on some hundreds of thousands of items. Click here for more information on batch mode hand held computers. Although more complex to set up, these units are simpler to use, and provide access to data in real time. They also intrinsically reduce the possibility of data loss. Click here for more information on hand held computers operating in RF mode. Hand held, hand-held or handheld? We provide systems built around RFID, Barcodes and Handheld computers. To reach Doreen by email, click here. To reach Keith by email, click here.